New York, NY (August 5, 2009) - Berkley Publishing Group author Charlaine Harris, the bestselling writer of the Sookie Stackhouse novels that are the basis for HBO's hit television show True Blood, makes an impressive showing on the August 9th, 2009 New York Times Bestseller List with each of the nine books in her series appearing on the list simultaneously. Dead and Gone (Ace Books, 2009), the ninth and most recent book in the series, will hold the #11 slot on this weekend's New York Times hardcover fiction bestseller list. The hardcover debuted at #1 on the May 24th bestseller list and has spent a total of 12 weeks (and counting) on the list. This unprecedented showing comes on the heels of Harris's recent appearance at Comic-Con International in San Diego, CA where she met fans and signed hundreds of books. About 800 fans showed up in hopes of scoring one of 150 tickets to Charlaine's afternoon autographing session on July 24th. The excitement continued the next day when Harris participated in a panel discussion with the cast and creator of True Blood. Harris answered several fan questions and thrilled the audience of 5,000 with the announcement of a new three book contract, promising that Sookie Stackhouse's adventures will continue into 2014. The Sookie Stackhouse series began in 2001 with the publication of Dead Until Dark. Not a traditional mystery, nor pure fantasy or romance, Dead Until Dark and its sequels broke genre boundaries to appeal to a wide audience of readers. Each subsequent book about the telepathic barmaid and friend to vampires, werewolves, and various other odd creatures, has drawn more readers. There are currently more than 10 million copies of the nine-book series in print in the U.S.- a number that is growing exponentially each week. Charlaine Harris has been a published novelist for over twenty-five years. A native of the Mississippi Delta, she now lives in southern Arkansas with her husband and family. In addition to the Sookie Stackhouse series, Harris also wrote the Aurora Teagarden and Lily Bard mysteries and is currently working on the Harper Connolly mystery series. 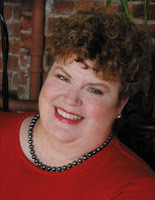 For more information about Charlaine Harris, visit her website at www.charlaineharris.com. For more on HBO's True Blood series, visit www.hbo.com/trueblood. Wow 9 on the list is some feat! Those books are great fun, I'm thrilled for her success! Christine - I can't even imagine how happy she must be about it! I think they were released again with True Blood covers, right? Donna - Too true! I'm happy to have the HBO series to tide me over, but I still anxiously await each book release! Kimberly, I was at the bookstore tonight and saw your blurb inside Rachel Vincent's MY SOUL TO TAKE. I got all jumpy and pointed it out to DH. That's awesome! Just wanted to let you know. I love this series. So glad there will be more books.